It's always a bit interesting to run across heraldry, or more often, heraldry-like objects, on store signs, storefronts, and advertising for shops of one kind or another. It's "interesting" because it's sometimes a toss-up as to whether the heraldry is an actual coat of arms or just something made up that the shop owner thought looked nice and gave the impression he or she was trying to make. In the specific instance at hand, I suspect that the arms for this little shop in Arras, France are invented, but see and decide for yourself. It's a little fish shop named "La Marée" (The Tide), but it's the blue banner affixed to its front wall that really caught my attention. The central image is the bust of a woman (perhaps a Marie, playing on the name of the shop? ); but at the top are two coats of arms and a coronet. The coronet appears to be that of a French comte, or count, with four pearls hidden, two behind each shield. The style of the shields, especially the husband's (on the left) makes me think these "arms" are invented for the shop. I could be wrong, of course, but it's not an arrangement of charges that I have seen before, and so I am skeptical that it is real heraldry. Still, it's yet another use of heraldry (or pseudo-heraldry), and I tend to think that that's a Good Thing™, if only because it shows that people still respect heraldry to a greater or lesser degree. We are all aware, I presume, that many vineyards use a coat of arms as their brand and place that coat of arms prominently on their wine labels. Well, the same thing occurs for other beverages. Witness the following two signs I ran across as I ambled my way around Arras, France. This sign for Le Cap Horn Café - Brasserie included an advertisement for Jupiler Belgian beer or ale. The arms would be blazoned as Gules a bull rampant argent. May your Christmas be a joyous one! I didn't go into the shop - it was still fairly early in the day, and it wasn't open yet - but I couldn't pass the sign. This confectionary (confiseur = confectionary) shop's sign translates roughly as "the heart of Arras in the old" (presumably meaning in the "heart of the old part of the city"). But of course it was the two lions (rampant addorsed, though the herald in me would prefer to see them combattant, facing each other) and between them the shield of the arms of Artois, which also appear on the inescutcheon on the arms of the city of Arras, as noted just a few posts ago. It's not necessarily the correct use of heraldry, but it's nice to see local heraldry being used, even if it is just to advertise a confectioner's shop. Getting back after my last several posts to our recent trip to Arras, France, I took the opportunity to walk completely around the Place des Héros. It helped that our hotel was on one corner of the Place, so I just began there and made a circuit of the square in a clockwise direction. 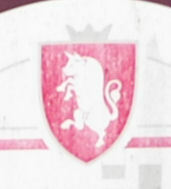 A number of the buildings on the square are marked with what might possibly be considered to be heraldry. I suspect that they are, in fact, heraldry-like shop signs, though I could be mistaken in that suspicion. Most of these would make would easily be accepted as a coat of arms. Are they truly heraldry? As I said, I don't think so, but it's possible. If I'm at a museum, no matter how many times I've been there before, when I get the opportunity to go again, I'm going to look around to see what's new or if there's something I hadn't noticed before. So while there, we all wandered about a bit to see what we could see, and I ran across another regimental flag on display, which contained an unusual "coat of arms" as its central element. 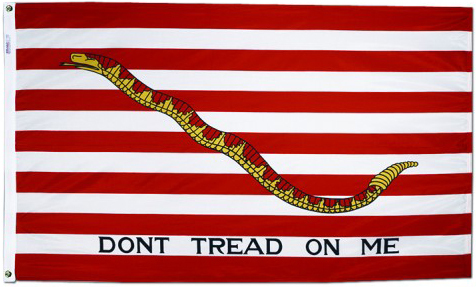 The unit to which this flag had belonged more than 150 years ago was the Second Regiment, New York State Militia (which was later redesignated the 82nd Regiment of Infantry) during America's Civil War (1861-1865). 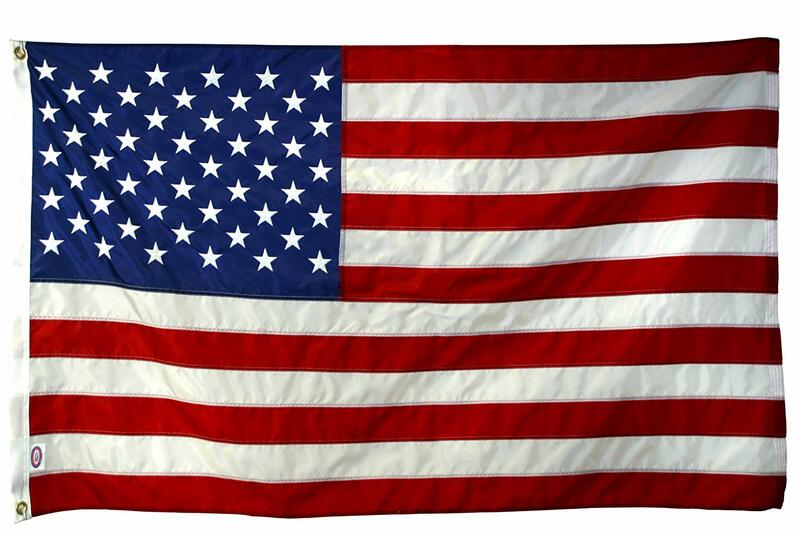 The upper left portion of the shield (dexter chief) contains the (incorrect) arms of the United States (this version has twelve rather than thirteen stripes, and places stars on the chief which are not present in the actual arms of the U.S.). 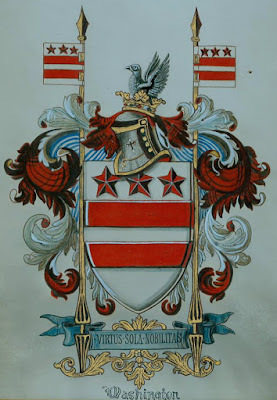 The upper right portion of the shield (sinister chief) contains the arms of the City of New York, the arms of a windmill set saltirewise between in pale two beavers statant and in fess two barrels/tuns palewise. Finally, the lower third of the shield contains the landscape arms of the State of New York, a scene of the Hudson River with the sun rising over a mountain peak beyond the river..
Once again, hardly a sterling example of heraldic design, but one which does say quite clearly, "New York City, New York" on its face. So to that extent, I suppose, "identifiability has been maintained." And identifiability has always been one of the watchwords of heraldry and heraldic design. A few years past, the Texas Department of the Sons of Union Veterans of the Civil War (of which I am a member) donated some money to the Texas Civil War Museum to help pay for the restoration of a regimental flag which was in need of conservation. It was made of silk, and the past 150 years hadn't always been kind to it. We recently got word that the conservation work had been completed, and we were invited to the Museum to see the results. Here it is in its frame, stabilized and behind glass: the Flag of the 45th New York Regiment of Infantry. 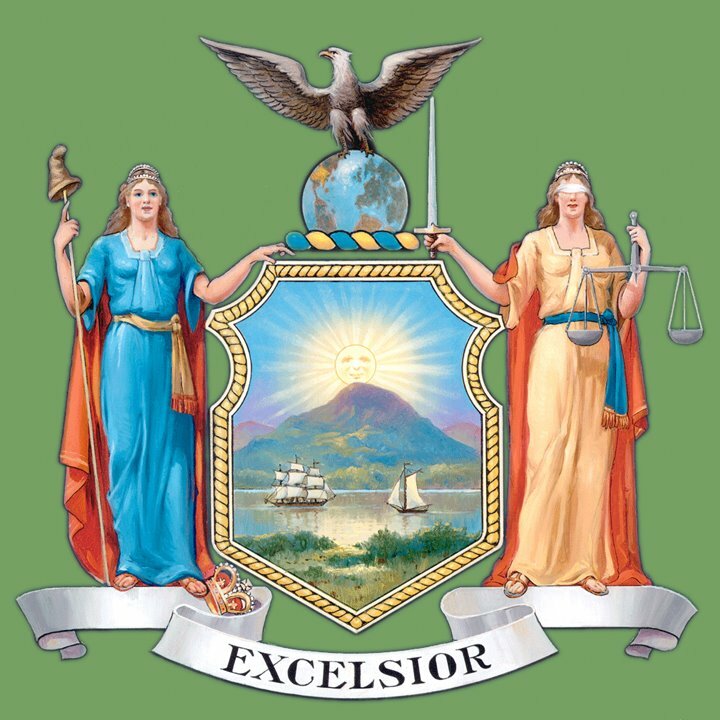 The central painted panel is a representation of the achievement of arms of the State of New York. It is, as you can see more clearly in the drawing below, an example of "landscape heraldry." The arms are a view of the Hudson River, with the sun rising over a mountain, supported on each side by the figures of Liberty and of Justice, with the crest of an eagle spreading its wings atop a representation of the globe, and the motto Excelsior ("Ever upward"). Not the best example of heraldry, but the arms - and the flag - are a part of New York's history, and it was certainly a pleasure to see this particular bit of history is being preserved. A recent (December 6, 2018) article by Meghann Myers in the Army Times features the insignia and shoulder patch designed for the new Army Futures Command, which is a new organization "in charge of leading the Army through its modernization renaissance." 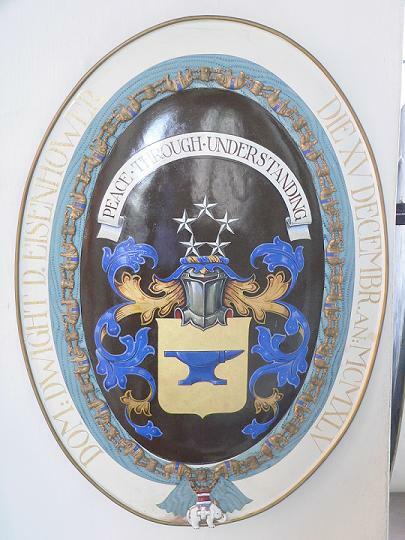 Charles Mugno, The Institute of Heraldry's director, was quoted as saying that: "What we try and do here is keep designs as simple as possible, which is really the essence of what heraldry is about." A guiding principle with which I completely agree. The AFC's motto, "Forge the Future," was the primary inspiration for the design. 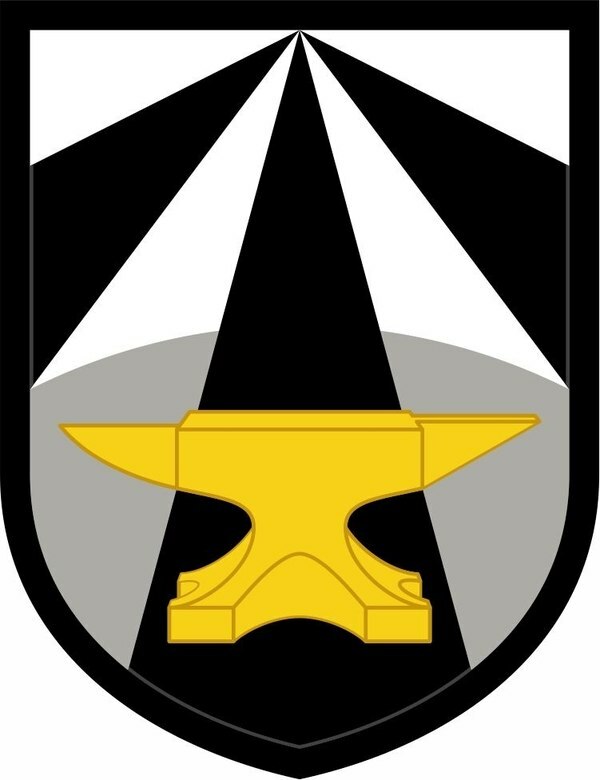 The article goes on to note that "the anvil motif was very reminiscent of [former five-star general] President Dwight D. Eisenhower's coat of arms," which you may see here below. All in all, the AFC's new insignia is an interesting design, meaningful and evocative; the only issue I might have with it is the arched "shadow" across the lower half of the shield, though I can think of a potential rationale - that of moving from the shadowed* past and into the lighted future. I recently purchased a new book with an heraldic theme: Oxford College Arms by John Tepper Marlin. (You can find it on Amazon at a very reasonable price, and I am finding it well worth the reading. It covers the history of the various Colleges and the origin and meaning of their coats of arms.) 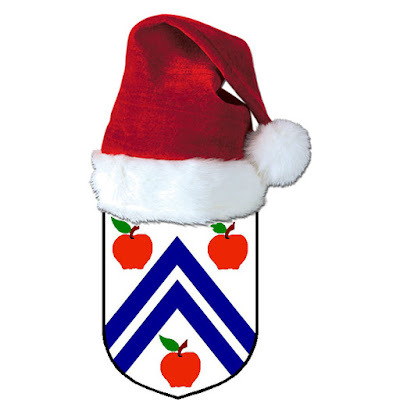 It does have a few minor issues, in that not all of the blazons of the arms are complete (e.g., in the blazon of the arms of Harris Manchester College, the tincture of the field and the number of torches are missing), but the color illustrations of the arms totally eliminate any questions about what the blazons should be. [M]any (including the author) believe that the mullets and bars of the Washington arms were a decisive influence on the creation of the U.S. Stars and Stripes. 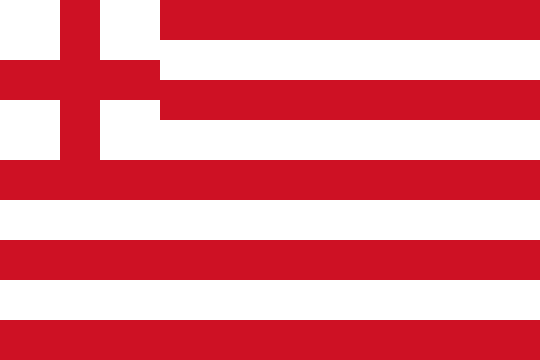 The most recent iteration of that flag, with fifty stars for each of the fifty states, is shown here. The question is how much, if at all, did the Washington coat of arms (below, from an old postcard) influence the design of that flag. 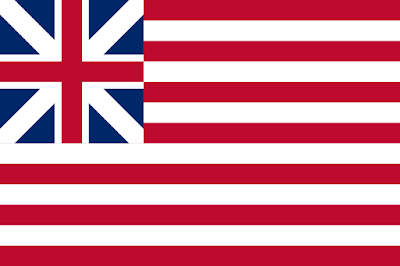 My argument is that the Washington arms had no influence upon the design of the US flag at all, and that the US flag was a simple evolution from a series of flags, generally naval, that logically resulted in the flag codified by the Flag Resolution of 1777. 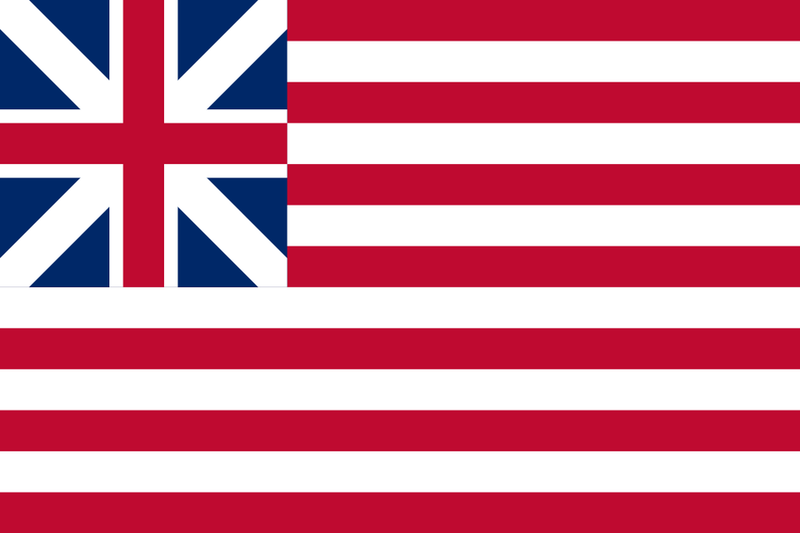 This final flag, "Old Glory," simply removes the cross of St. George of England and the cross of St. Andrew of Scotland from the blue of the canton, the "union" of the Flag Resolution of 1777, and replaces them with a "new constellation" of thirteen stars, which were displayed in various arrangements and with varying numbers of points (5, 6, 7, 8, or more) at the whim of the manufacturer or seamster/seamstress, until custom settled on five-pointed stars in the era following America's Civil War of 1861 to 1865. 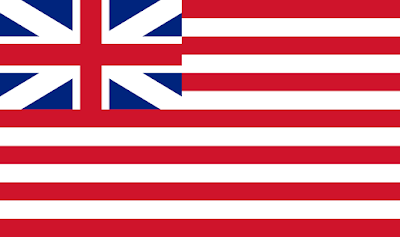 In short, they were replacing one Union with another Union, one a union of two kingdoms joined in one (England and Scotland, since joined by Northern Ireland with a cross of St. Patrick in the modern Union Flag, often called the Union Jack) for a union of thirteen states. I know which one I think is by far the most likely. 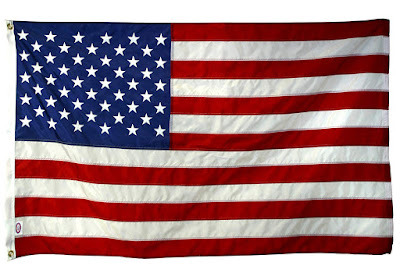 * By June 1777, the date of the Flag Resolution, the Continental Army under Washington had: forced the British to evacuate Boston in March 1776 by placing artillery on the heights overlooking the city; lost the city and port of New York in a series of battles from August through November 1776; and convinced the British to evacuate New Jersey in another series of battles from late December 1776 through January 1777. The war continued with mixed results for nearly five more years before culminating in the surrender of Lord Cornwallis at Yorktown, Virginia in 1781. While wandering about the center of the city of Arras, France, I walked by a public building which had a couple of coats of arms on its facade. In this instance, I'm not speaking of the arms at the top of the facade; I will discuss those in my next post, and they aren't the arms of the City in any case. No, I'm talking about the three shields in a row at the top of the arched window in the center of the building. See? Very decorative, and beautifully carved, but not heraldic. 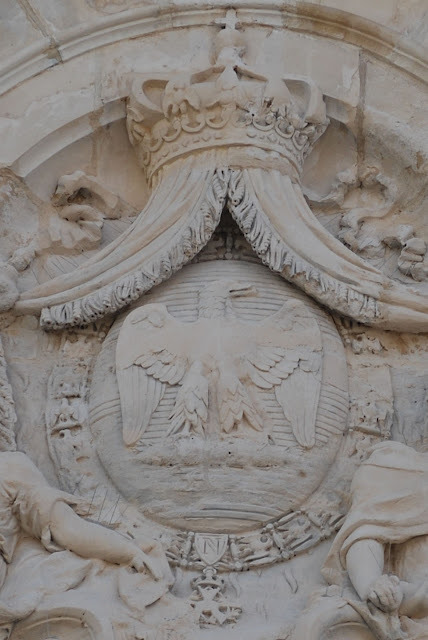 The central shield, however, while also decorative and beautifully carved, display the arms of Arras. Or, more correctly, it displays a variant version of the arms of the city. If you click on the image above, it will take you to a larger image, where you can see there more clearly that the label of three tags, each of which is charged with three towers, is carved her as a label of four tags, each charged with three towers. Despite this "error," though, it is a remarkably detailed carving, even down to the hatching,* with vertical lines on the main shield for red and horizontal lines on the smaller inset shield (inescutcheon) for blue. It was, as it always is, a real pleasure to see a city using its coat of arms in such a public way. * Hatching: a system developed in the 17th Century of drawing parallel lines in various directions used to indicate colors in a monochromatic environment, such as a book printed in black and white, or a stone carving, as here. 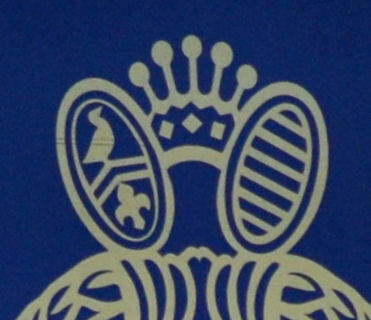 While Arras, France uses and displays its coat of arms all around the city, they also have and use a semi-heraldic logo to help, as so many want their logos to do, "promote the brand". I saw this logo on some of the tourist information published by the City, and it is also displayed quite prominently on a flag flying on the front of the Hotel de Ville, the City Hall. It is placed immediately below a red square which contains, in the fashion of heraldic "dimidiation. "* a representation of the regional style facade shape of many of the buildings in the area (for examples, see the photographs immediately below), combined with the upper half of the golden rampant lion which appears as supporters of the City's arms and on the top of the Belfry. 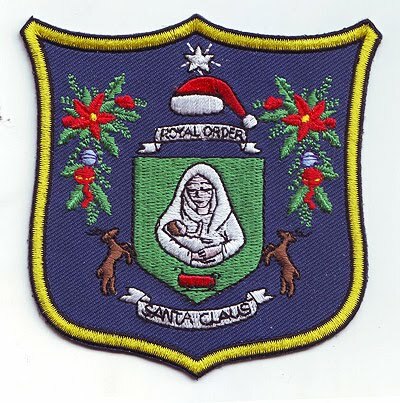 All in all, it's a decent logo, and I am grateful that they use it in conjunction with, rather than as a substitute for, their coat of arms. * Dimidiation: the combination of two coats of arms by juxtaposing the dexter half of one and the sinister half of the other on a single shield. Dimidiation went out of fashion fairly quickly, as it often created some remarkably ugly, and sometimes very confusing, heraldic displays. On the top of le Beffroi, the belfry rising above the Hotel de Ville in Arras, there is a golden lion statant erect regardant sustaining a weathervane of a sun. At the top of the belfry, 75 meters high, stands a lion, symbol of power, holding a sun, emblem of Louis XIV. When the Sun King visited Arras in 1667, he was greeted coldly by the inhabitants, who feared that he would restrict their communal liberties, acquired since the end of the 12th century. Nevertheless, it is said that the Arrageois (the people of Arras) added a sun to the lion who adorned the belfry, in order to show their goodwill to the French monarchy. So there you have it: the lion holds a sun to honor, or at least respect, the Sun King, Louis XIV.